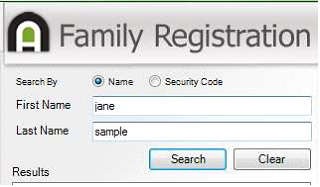 The Family Registration application is a .Net click-once application, meaning it is a Windows workstation-based application. It is designed to be a manned-station where the user (volunteer) can easily search the database to verify the visitor is not an existing record. Once the volunteer determines the record does not exist, the new record/family can be entered and properly checked into the appropriate class. This feature requires the workstation/computer/tablet to have .Net 4.5 installed and Microsoft Report Viewer, which are both available at no cost. •Volunteers can access the application from any computer on the network. •Each volunteer can have a unique login. Therefore, it is an ideal application to use to allow volunteers to do data entry work for your organization without going through the hassle of setting them up as a new user on your network. 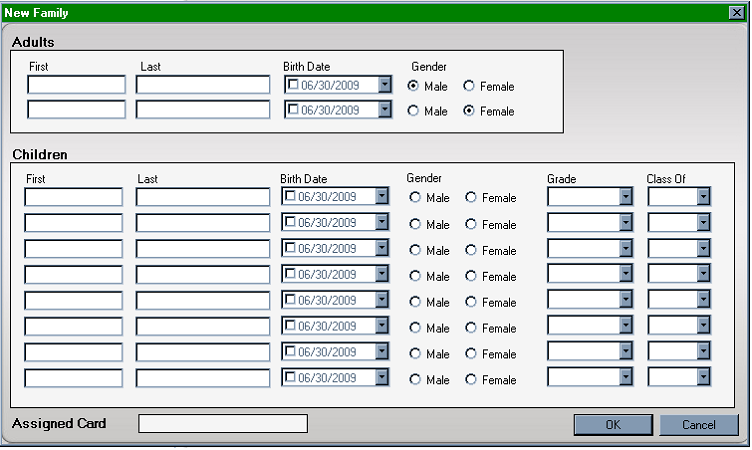 •The user interface of Family Registration puts most of the important fields for a record on one page, eliminating the need for data entry personnel to navigate between multiple pages to add or modify a record. 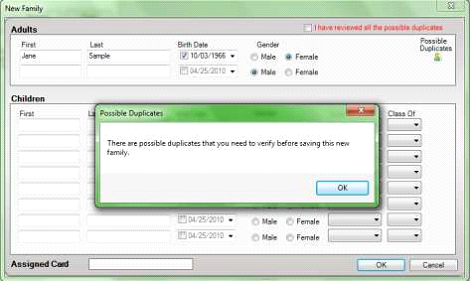 •The Family Registration application has a built-in control that can reduce duplicate records. •Review and customize Family Registration Application Settings such as default member status, attribute groups, default campus, and allowing Check-In. •Set the Small Group Category ID in the Family Registration application. 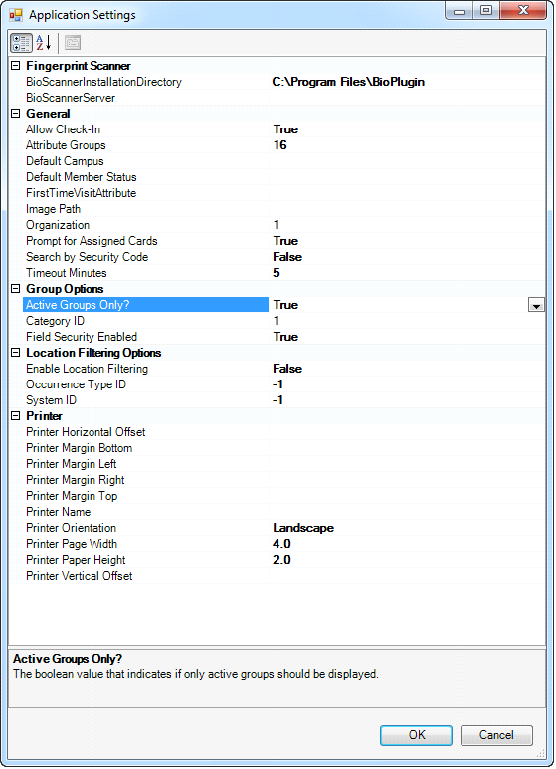 •Install Microsoft Report Viewer 2008 and 2010 on all PCs that run Family Registration. 1. From the Membership menu, click the Family Registration option. 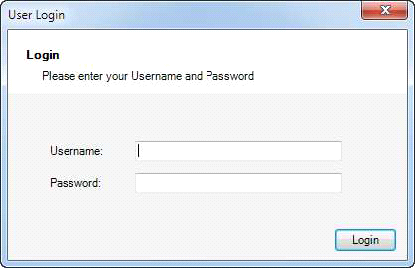 Enter your login information. 2. Click the Application Settings icon. 4. Select how Arena should flag First Time Visitors. The First Time Visitor report in Membership consists of records flagged. 5. Use the Quick Search fields to first search for the record to be sure it does not already exist. 6. If the same name already exists, these records display for you to review. 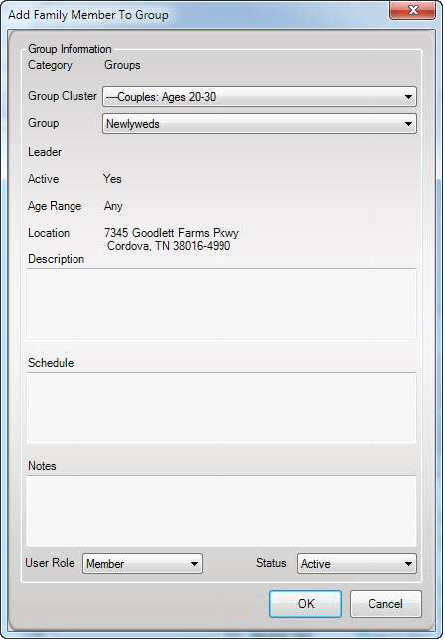 You can select any record for additional information to display in the Person Details window. 7. Click the Add New button to enter information for the new person. You can enter children with no adults. 8. Enter the First and Last Name, and Birthdate. If you enter a name and birthdate that matches an existing record, the below error message displays. A complete date in MMDDYYYY format is required. If the year is not available, consider using a default year such as 1900. 10. Click the Possible Duplicates icon to view additional information of the records. 11. You can select any record and it displays in Family Registration or click the Close button to enter a new record. 12. Click the I have reviewed all possible duplicates check box. 13. Click the OK button to proceed with adding the new record or family. You can enter children without an adult. 14. On the New Family page, fill in the first and last name for every family member. Arena allows one adult male and one adult female in a family, so it is important to enter the appropriate name in the corresponding line for the adults of a family. All other persons you add to a family are with the role of “Child.” Enter a birthdate, if available. You must select a gender for each person. Once you enter all family members, scan or swipe a check-in card for the family. The card ID number shows as the Assigned Card number for that family. Click the OK button when done. 16. Check-In can use a barcode or magnetic strip card to make it easy to select the correct family. When viewing the Family Information page, simply scan the barcode or swipe the card. This enters the code in the Cards Assigned section. 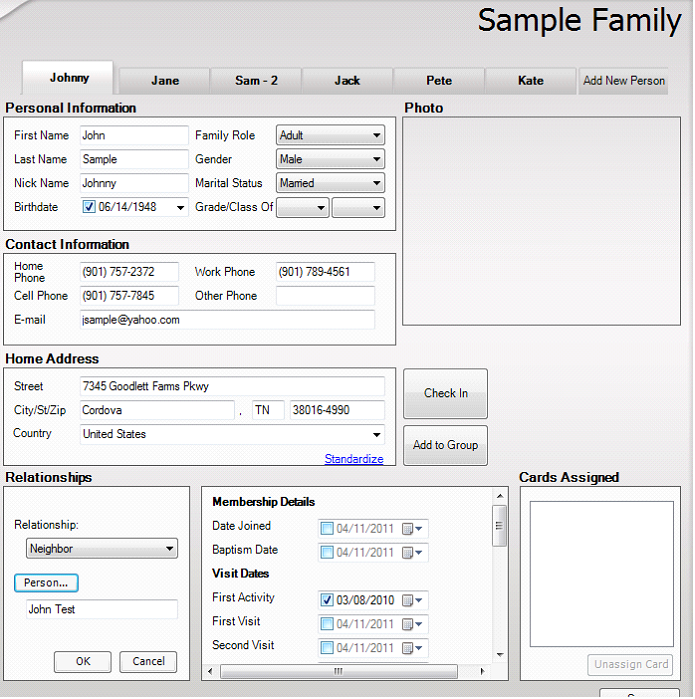 All cards you assign apply to all members of a family. You can have multiple cards, if desired. Click the Unassign Card button to remove a card. 17. Click the Save button. If your organization uses cards and you have not assigned a card to the new person, the Add Card pop-up displays. 18. Click the Yes button to continue without assigning a card. 19. After saving the record, you have the option to Check In the person or Add to Group and Check In. Arena formats 10-digit phone numbers. 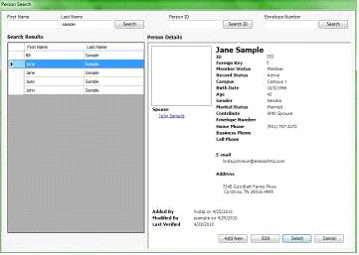 You can standardize U.S. addresses without saving the record. If you enter an international address, you do not need to enter the city, state and zip. 20. 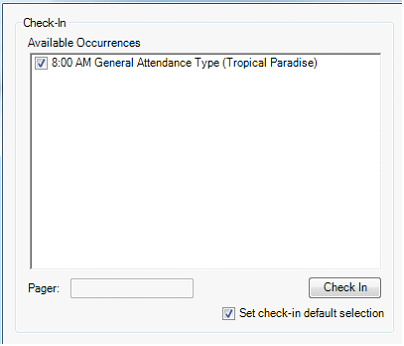 If you select Check In, select the applicable Occurrence(s) for the person. You can optionally select “Set check-in default selection” so that the next time the person checks in using Arena Check-In, Arena associates them with the Attendance Type. 21. Click the Check In button. You can also set the default Attendance Type Occurrence for this person. This pop-up window also displays where the person is currently Checked In. 22. Click the Close button. 23. 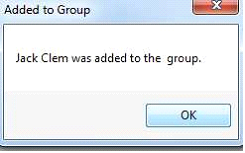 If you select Add to Group, you can select the Group Cluster and existing Group. 24. Select User Role and Status. 25. Click the OK button. 26. The Group Confirmation displays. 27. Click the OK button.